From the moment the curtain went up it was clear that set designers Totie Driver and Matt Kinley had achieved something really special. 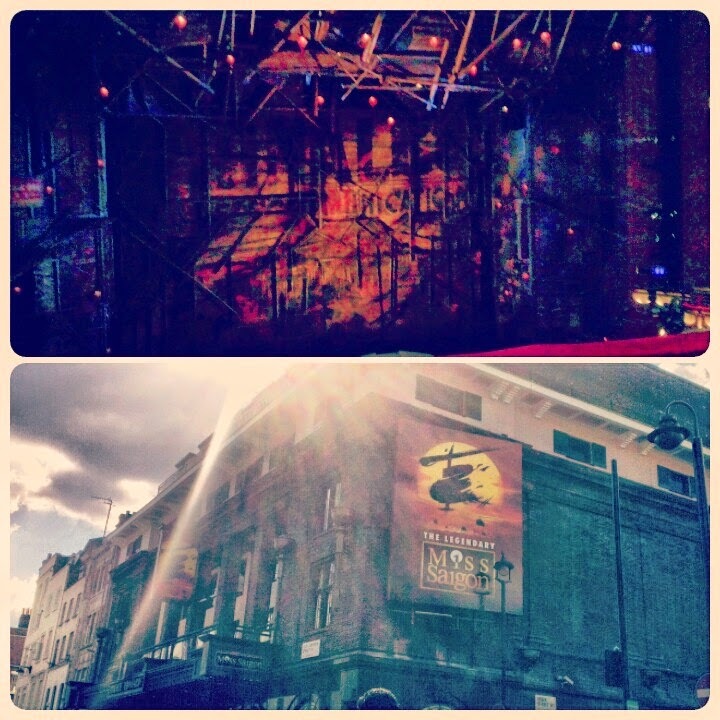 The set for Miss Saigon is more than just a backdrop or a glorified prop for the actors to interact with; the busy medley of buildings, furniture, staircases and general décor really convey the hustling and chaotic atmosphere of Saigon, whilst the consequent areas of shadow heighten the underlying and often foreshadowing sense of fear. There is never anything cliché or stereotypical about the set, which is often a danger when portraying a particular culture, event or time-period that people have very generalised perceptions about. What’s even harder to impress with is the way in which set is transformed from one scene to another, but this is another great success of the show. It’s near impossible to second-guess how the scenes will be changed and the subtlety of the transformations is a credit to the realism of the whole production. The set carries meaning in its own right, with one such example being in the way that Chris and Ellen’s bedroom (complete with the American city skyline) is elevated above Kim’s slums during ‘I Still Believe’: an image that hints towards the overbearing presence of the Americans in Saigon during the war and points out the harsh reality of the state in which Kim’s country has been left since their departure, complete with the ‘American Dream’ ideal that hovers above a lot of the Vietnamese. The one scene that I was left a little disappointed with was the iconic helicopter scene. This may be down to the hype that has surrounded this particular scene and the speculations within the theatre world of how it would be done, and I won’t give much away for those who are yet to see it, but it does feel a little like a boasting of all the possible technical skills that can be implemented, in a way that detracts from the real tragedy of the scene. Miss Saigon’s costumes mirror everything that the set achieves, and Adreane Neofitou has created the perfect contrast in the early scenes between the raunchy and over-sexualised bar girls and the way in which Kim is dressed in pale shades to emphasise her innocence. Kim’s clothing gradually gets darker as she is exposed to the cruel truths of the world; however we are reminded of her heartbreakingly young age as she dresses in white once more for her final crushing moment. Whilst the orchestra do an amazing job under the direction of Alfonso Casado Trigo, it is with the balance between the music and the singing that my main criticism of Miss Saigon lies. For a musical in which no speaking occurs and you learn everything through song, being able to hear and understand what is being sung is critical, yet there are a number of instances where straining to listen become a necessity and words or even phrases are missed. This is mostly an issue during the louder and more fast-paced numbers of the first act. Arguably the biggest talk around this show has concerned the part of Kim. As if the task of finding a teenager with enough conviction to play the part wasn’t enough, how could they live up to the standards of Lea Salonga? Incredibly, Eva Noblezada does all this and more. The 18-year-old has such a command over her voice that it is hard to believe this both her West End and professional debut. Every note in the earlier scenes seems effortless and pure, and as the world begins to turn against Kim, Noblezada employs the extraordinary illusion that her emotions are carrying her words and each note of struggle and desperation, rather than the other way around. What a rare talent to find in someone so young and fresh to the industry. Noblezada’s innocence and naivety are spot on, but what is most impressive is her grasp on motherly instincts and utter determination to protect her child, regardless of what she must do to achieve it. I didn’t have a shred of doubt about the authenticity of Kim’s final decision and that is entirely down to Noblezada’s remarkable depiction of the character. Through all my listening to the soundtrack of Miss Saigon I completely underestimated the significance of The Engineer, but the character’s integral role throughout earns him the right of being the principal lead of the show. The Engineer seems like a tricky role to play; how do you get inside the head of a man who continues to take advantage of a young girl with nothing? Briones presents a character that gets stronger and more convincing as the show progresses and by the time he reaches ‘The American Dream’ you understand that his motives and beliefs make him just as vulnerable and naïve as Kim. The Engineer’s comic inserts are painfully sharp against the suffering of others and your laughter often takes you by surprise, but he is a completely necessary representation of part of the Vietnamese society. Though I find the character of Chris a little weak at times, Alistair Brammer does a great job of convincing that the destructive environment of war lead him to falling so deeply for Kim and wanting to protect her best he can. Brammer’s vocal strength is undeniable with his rich tone and impeccable vibrato – yet there are moments when he could benefit from holding back the vibrato a little and allowing Chris’s emotion to take precedence. One of the most moving moments of the show was the scene in which Chris describes to Ellen what the war was like and explains his relationship with Kim; Brammer’s acting really excels as he pushes himself to convey every ounce of despair. As much as I tried to appreciate Tamsin Carroll’s portrayal of Ellen, this was one character I couldn’t quite connect with. Perhaps it was down to the much younger image I had in my head, but Carroll’s Ellen seemed a little too mature and ‘perfect American housewife’ for the same Chris that fell for Kim just three years before. However if you were to accept this version of Ellen, the way in which Carroll handled the meetings with Kim were convincing and she had just the right balance of affliction and control. As is probably noticeable from this write-up, there is so much depth to the plot and various layers on stage that it is impossible to comment on everything, and there are many other strong characters, songs and pieces of staging that deserve a mention. Miss Saigon is definitely a show I would like to see again before its run ends, even just to pick up on all the details I missed the first time. It's amazing! You should definitely go and see it if you can! Thank you so much :) I'm finding it really hard to find other blogs that do theatre reviews at the moment, but hoping to find some more as I go on! Hiya, I've given you a follow. Thanks for reading!